How do you make fried chicken even more awesome? You add sour cocktails. Chick N’Sours in Dalston does just that. 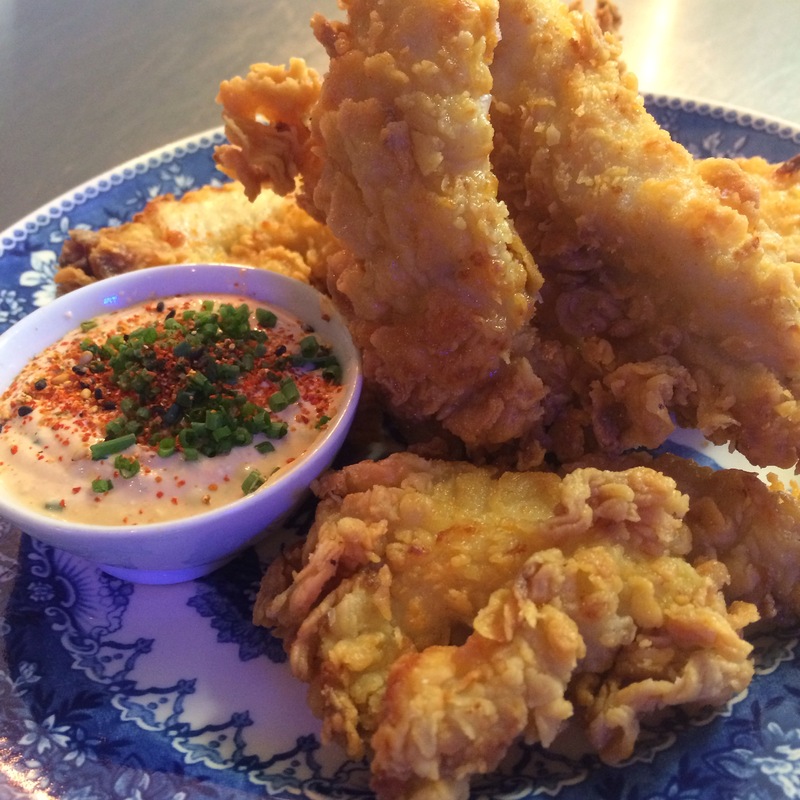 Here’s my review of the best fried chicken in London. A tiny shop on 390 Kingsland Road, Chick N’Sours is every fried chicken fan’s dream. Part local fried chicken shop, part cocktail bar, the new joint serves “a whimsical menu of herb fed fried chicken, next level sides, sour cocktails, local beers & cracking soft serve ice cream creations.” A feast of both classic fried bliss and fusion cuisine, Chick N’Sours works with small British producers to source free-range chicken and tasty vegetables. We started the night with a Mango N’Balsamic sour, made with Bourbon, lime juice, sour, mango puree and balsamic syrup.You will want to down this amazing cocktail, but you better pace yourself: it’s a pity to waste it without pairing up with the chicken – and you’re going to need that once you see what comes next. Cocktails at Chick N’Sours are fresh, special and cheaper than the average East London bar: they only cost £6. If you’re going with another person, your best bet is ordering two starters to mix and match. We went for the Hot Disco Wings (£5.50), chicken wings in a rich hot sauce that is just spicy enough to deliver the flavour without actually killing you on the spot. We also had the fantastic Szechuan Aubergine (also £5.50), a sort of tempura salad with chilli and soy sauce that can’t be beaten. The mains at Chick N’Sours are pure excess. Unlike too many restaurants, here portions are monster-sized the way I like them. The Bun (£10) is the biggest burger I’ve ever seen, described by my friend as: “Chicken on top of chicken” and made with Korean fried thigh, Gochuyang mayo, chilli vinegar and crunchy slaw. In a nostalgic fit, I went for the chicken tenders (£8) with Chick N’Sours own barbecue sauce, a trip to my childhood, but much bigger in size and much greasier. Finishing the tenders was a challenge, but they’re so good you really can’t help it. On the side, we shared a pickled watermelon salad with walnut and coriander, the best way to finish the meal on a fresh note. Chick N’Sours’ David was so kind to have us try their salted milk chocolate soft serve ice cream with miso crumbs. If you think you’ve already had the best fried chicken in your life, think again. Stop by Chick N’Sours, order any of the chicken dishes on the menu, grab a very 90s water tattoo with a chicken to show off with your mates and thank me later. The Italian version of the article is on Italian Kingdom.